Dit artikel legt de richtlijnen voor het maken van logo's. Kijk op openSUSE richtlijnen voor het handelsmerk als u op openSUSE gebaseerde projecten wilt herdistribueren met openSUSE logo's. De openSUSE Linux distributie wordt geïdentificeerd door het Geeko kameleon dat kan samengaan met het openSUSE logo. Het SUSE groen is #73ba25 of (115, 186, 37) in de sRGB ruimte. Bij printen, gebruik het Pantone Uncoated #368 groen. When using the logo on top of textured or colored background, use the monochrome version of the logo. The SUSE green should only be used on white backgrounds. There should be sufficient whitespace around the logo. Avoid placing the logo close to other elements such as photos or text paragraphs. Do not use other color treatment than SUSE green or shades of gray. 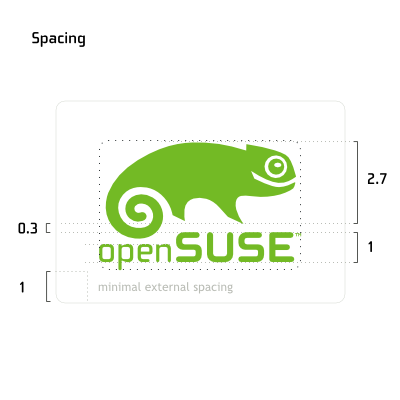 Do not change the layout of the logotype in relation to the chameleon graphic. Do not mix the logo with other graphical elements such as emblems to create derivate project logos. Do not stretch, skew the logo. Always keep the aspect ratio intact when resizing. The geeko head is the secondary identity. The round button can be freely colored and combined with other graphical elements to form spinners or project logos. It is also allowed to give it custom color treatment. 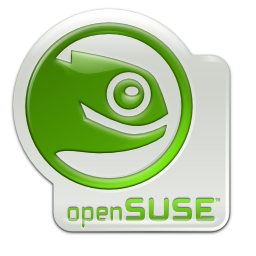 A typical use for the Geeko button is for openSUSE related projects. Deze pagina is het laatst bewerkt op 5 nov 2010 om 22:26. Deze pagina is 2.699 keer bekeken.